The right sunglasses won’t just make you look cool and trendy but will also go a long way in protecting your eyes and sight. The best types come in designs that prevent dust, dirt, wind, bugs, and other debris from entering your eyes, they help to filter harmful UV rays that are emitted by the sun and also protect your eyes from excess light or brightness. These eye accessories can be worn during camping, hiking, cycling, skiing, surfing, and many other outdoor activities. You will come across all kinds of sunglasses. They will vary by brand, design, weight, flexibility, color, material, light filtering, price and much more. Truth is picking a specific piece from the so many isn’t easy. Chances are you will spend lots of time and effort, or even purchasing the wrong product. To help you in your search, we decided to review the top 10 best sunglasses for outdoor in 2019. Interchangeable Lenses: They allow you to change the lens to suit the need at hand as well as personal preferences. Polarized Lenses: These sunglasses help to minimize sun glare and protect the eyes from too much light. Additionally, they help you see better in bright situations like on snowy surfaces. Photochromic Lenses: Also known as “transitional”, these sunglasses will automatically darken when it’s too bright and brighten when gets darker. Bea•CooL Sunglasses are extremely comfortable and stylish pair of sunglasses. They are made with high-density Revo coating that will keep the original color making the scenery more clear and protecting your eyes perfectly. 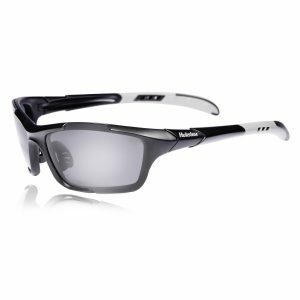 The lenses likewise constructed with high-quality shatterproof TAC material that is durable ensuring prolonged wearing. Other than that, the Sunglasses are lightweight, unbreakable and scratch resistant thus ideal for any outdoor activity. With its special anti-slip rubber nose pad will evade the sunglasses from dropping down whenever you swear and will fit perfectly in your face making you feel relaxed and comfortable. The package includes cleaning cloth, hard protective case and sunglasses screwdriver. 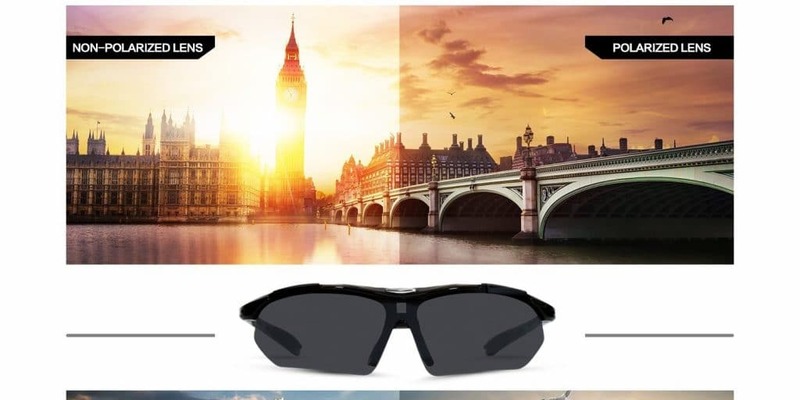 Both men and women will love these polarized sports sunglasses from the MiluoTech. They come with a robust and comfortable frame while the lens is manufactured from PC. The shatterproof, anti-scratch, and anti-glare glare lens protect your eyes from sunlight and also improve visibility outdoors. They feature a decent size, feel very light and comfortable, and are ideal for most sports including golfing, cycling, skiing, riding, baseball and running. Other pros are lightweight, durable, stylish, easy clean, and comfortable. 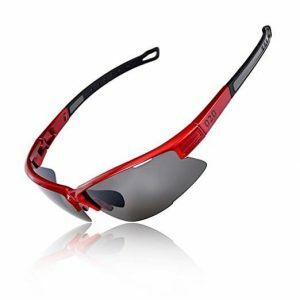 Riding, racing, golfing, hunting, driving, fishing, climbing, and skiing under the bright sun is more convenient with these Red/Black sunglasses by 020. The polarized eye accessories are fit for men and women and feature a super light and flexible polycarbonate material. 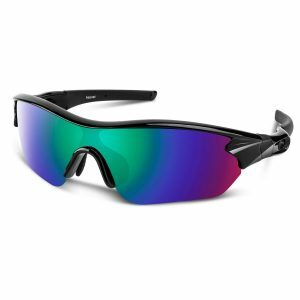 The polycarbonate lenses come in 7 layers for maximum polarizing effect and durability and block up to 100% UV rays. They also eliminate scattered and reflected light, minimize glare, and restore true color. Extra comfort on the nose and ears is guaranteed by the T90 memory. Key advantages are the good comfort, good flexibility, easy to wear, good UV protection, and cool design. This is the most fashionable sunglass perfect for both men and women. They will offer 100 percent UVB and UVA protection against sunlight filtering. In addition to that, they will also eliminate scattered light, reflected light thus protecting your eyes perfectly. The frames are made of lightweight and durable high-grade TR 90 material that does not break easily. The Sunglasses is packed on a hard protection portable case that is easy to carry. Other than that, the sunglasses come with a lifetime breakage warranty on lenses and frames. The customer can also enjoy a 30-day money back guarantee where they can return and get refunded if they are not satisfied with the product. 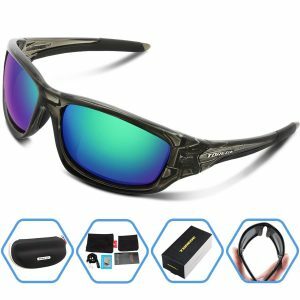 This Polarized Sports Sunglasses have lenses that reduce irritating reflections and glare produced by light that is reflected from surfaces for example road, water, snow, and sand. Someone who rests or works in the sunshine will appreciate a clearer view and reduce glare. Enjoy motorcycle riding, biking, volleyball, fishing, running, cycling, skiing, tennis, golf, football, baseball and, also all outdoor sporting activities without having any discomfort. They are incredibly stylish comfortable and provides you the safety necessary to avert any damage and also lets you appreciate the sunny days without having any worries. They absorb 100% of ultraviolet light and eradicate 99% of glare light. The TOREGE brand offers different types of sports sunglasses. One of the well-known versions is this type that features transparent green and gray lens. The REVO polarized lens consists of 7 layers for maximum protection and offers 100% UV400 protection to inhibit 100% UVA and UVB rays. It also restores true color, improves visibility, eliminates scattered light, reflections, glare and are also shatterproof. Other advantages include high quality, lightweight, smooth surface, and cool design. Tifosi Sunglasses lens offer ultimate protection when it comes to the dust, wind, and branches that may get in your way during a climb, a trail run, mountain bike ride or trail run. The hinge on this sunglasses is fully integrated to ensure lasting comfort and long durable use. Moreover, the nose pieces have a hydrophilic rubber that is comfortable forming a custom fit to your face. This Sunglasses are constructed with Grilamid TR-90 nylon material that is lightweight and will resist UV damage and chemicals. The frames are designed to offer comfortable all-day wear for outdoor or sports activity. 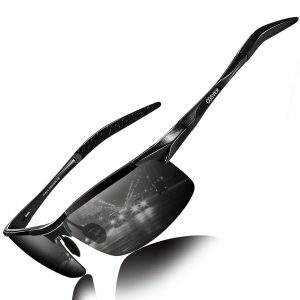 Ideally, these sunglasses will reduce glare and enhance visual clarity. 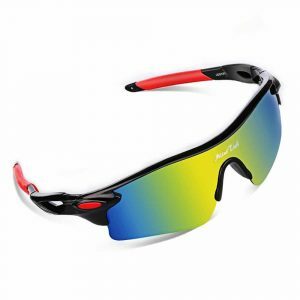 Another polarized sports light-weight sunglasses that comes with stylish and attractive frames. COSVER Sunglasses will visually restore true color while eliminating scattered and reflected light. They also feature UV400 Protection Coating that will block all the harmful UVB and UVA rays. The TAC polarized triacetate lenses are both scratch and impact resistant making them unbreakable and durable. It’s a perfect choice those who like climbing, skiing, racing, fishing, running, driving and they are also a high fashion accessory for daily wear. Moreover, the nose pads and frame are adjustable in order to fit your size. Comes with a lifetime breakage warranty. Hulislem is among the decent brands of Sports Sunglasses as they come with plenty of features. They are ideal for motorcycle riding, cycling, fishing, golf, tennis, baseball, running and more. Made with lightweight polycarbonate frame thus great to individuals who are not used in wearing glasses. On top of that, the lenses are mirror flash coated limiting the amount of light that is exposed to your eyes. Perfect for both men and women. 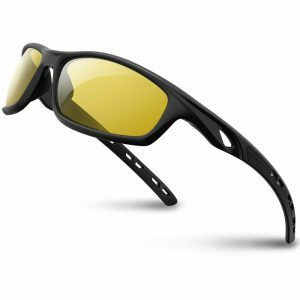 With stress resistant o matter frames, these sunglasses are rugged and tough enough in order to meet up any challenge that it may encounter. You will get amazing color contrast, depth perception, and clarity after using these Sunglasses. 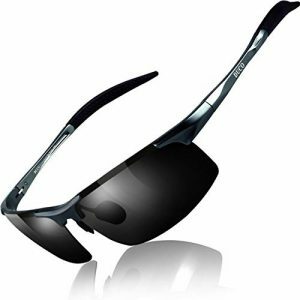 If you want to present the good gift to a sportsperson, then take a look at this Sunglass from DUCO. 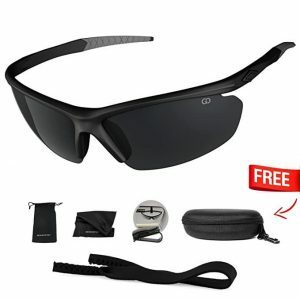 It’s one of the high rated sports sunglasses that you can find in the market. It will eliminate scattered light or reflected light and will visually restore true color. Aside from that, it will block UVB and UVA rays and the lenses are scratch and impact resistant. This makes them perfect for climbing, racing, running, cycling, skiing, and all outdoor activities lovers. The package comes with complete accessories needed as it includes polarization test card, microfiber cleaning cloth, microfiber pouch, and a glasses case with carabiner. The sunglasses are backed with a lifetime breakage warranty and 30-day money back guarantee. Sunglasses come handy in many outdoor situations such as camping, hiking, cycling, and skiing. Finding a product is also easy thanks to the many products. However, not every accessory will offer the best performance and service. It may be too rigid, too light, doesn’t have the best protection, maybe a little tight, too loose, or is flimsy. Additionally, it may not offer good protection against excess light/brightness, glare, scattered light, reflection, UV, bugs, insects or wind. In this review, we took a peek at the top 10 best sunglasses for outdoor in 2019. The listed items score highly in the important areas such as comfort, flexibility, protection, durability, and affordability. Not only will they offer the best protection and service, but will also make you look cool.